It’s been seven days since we carved into our orange roast turkey and we’re still eating leftovers. We’ve had turkey sandwiches, and turkey tacos. I debated making turkey soup, but that can be hit-and-miss and I didn’t want to miss and end up with gallons of soup. 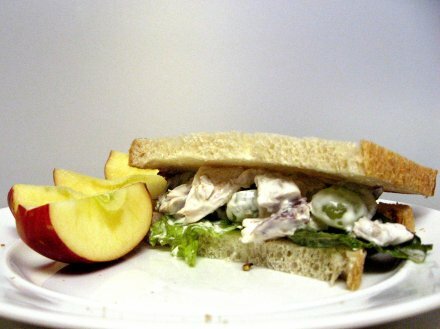 Today’s new and creative use for turkey was turkey salad, like Chicken Salad, only with turkey. It tastes quite good on sourdough.